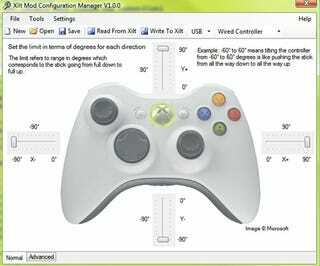 Xilt, a mod for an Xbox 360 controller, will be available in about a week, letting you tilt forward and back or left and right with your wired or wireless Xbox 360 controller using an accelerometer similar to the one in the Nintendo Wii. It's a do-it-yourself kind of thing, and its creator says it takes just 10 to 15 minutes to install its seven wires. Its hardware and software are created by an Xbox 360 modder who calls himself GreenGiant, who hasn't determined exactly what the price of this modification will be yet, but he says it might range somewhere between $35 and $45. Check out one more graphic, the Advanced View screen of the the Xilt Mod configuration manager, after the jump. Looks like this would be especially useful in a driving or skateboarding game.